Animal shelters from Galveston, Texas to Tallahassee, Florida have been significantly impacted by the Gulf oil spill crisis. Unprecedented numbers of pets have been relinquished as families in the region continue to face economic hardship. The Petfinder.com Foundation has stepped forward to respond to the need of these homeless animals impacted by the disaster with a special $150,000 grant program. Petfinder.com released survey results this past week showing that 43 percent of animal shelters and rescue groups in Alabama, Florida, Louisiana, Mississippi and Texas have had an increase in pet surrenders since the Gulf oil spill in April. As a result, they need assistance in funding their day-to-day operations, as well as help in rehoming these animals. Shelters and rescue groups from across the country have stepped forward and offered to take animals from the Gulf Coast shelters to free up additional space in those shelters. These groups are also in need of financial assistance to transport and care for the animals they take in to their programs. Shelters in certain areas in the Gulf Coast states as well as other shelters that want to help out Gulf Coast shelters can apply for financial support from a grant program funded by the nation"s largest adoptable-pet database. Merial"s "Paws to Save Pets" and The Animal Rescue Site"s Gifts That Give More Program are partnering with the Foundation in this $150,000 grant program. Shelters located within 30 miles of the Gulf Coast can receive funds from the $100,000 in operating grants under the program. An additional $50,000 will be given (in $1,000 grants) to Petfinder member shelters and rescue groups that can transport or take in 10 or more animals from the impacted areas. This effort will decrease the burden on the Gulf Coast shelters and help increase the adoption numbers. Shelters and rescue groups interested in applying for a grant under this program should send an e-mail to outreach@petfinder.com. The Petfinder.com Foundation helps support thousands of animal welfare organizations that are members of Petfinder.com. The lives of hundreds of thousands of homeless pets are saved through adoptions on Petfinder.com. The Foundation also helps shelters prepare for and recover from disasters and works to make shelters across the country more successful and sustainable. was founded in 1996 and houses and offers access to the largest database of homeless pets on the Web. The website features over 350,000 adoptable pets at more than 13,000 animal welfare organizations nationwide. Millions of online visitors search the database daily helping homeless animals across the country find new homes. Sookie (calico cat) is available for adoption from Galveston County Animal Services. 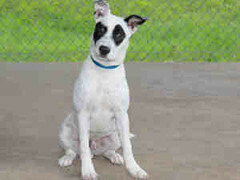 Kenny (white pit bull terrier mix) is available for adoption from Tallahassee Animal Service Center. 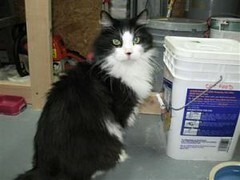 Deuce (black and white cat) is available for adoption from Animal Rescue New Orleans.